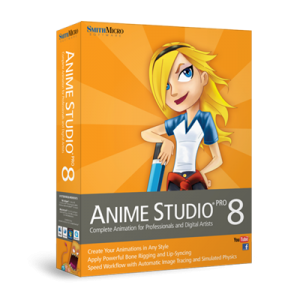 We’ve been playing with Anime Studio 8 Pro and love it – for years I’ve been bombarded with “special offer” emails that told me how amazing this programme was so we finally gave in. I’m glad we did – Julia and I are having lots of fun creating 2D animations. 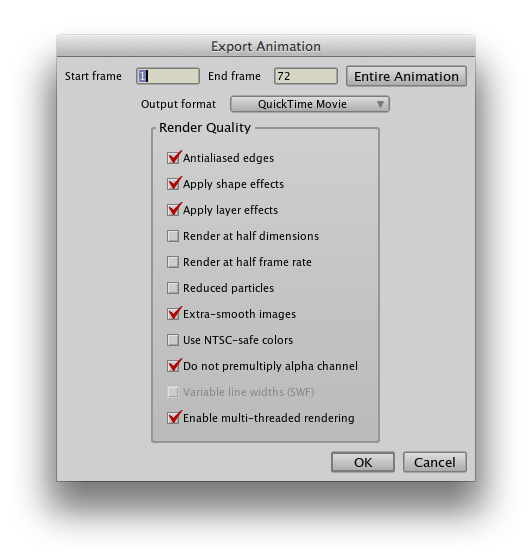 How to render an animation while retaining the Alpha Channel. This feature is useful if a render takes a long time and you’d like to import the final render into another project, or duplicate the same render in your existing project (say an explosion, just like in Tutorial 6.4). The manual states to use the Quicktime export option with 16mil+ colours and PNG codec. Doesn’t exist in Anime Studio 8. Instead, choose Animation and select “do not premultiply alpha channel”. Do not choose PNG here. Even though this will retain your alpha channel, it will render your movie as an image sequence which makes importing difficult and messy. Click OK and give your movie a file name. 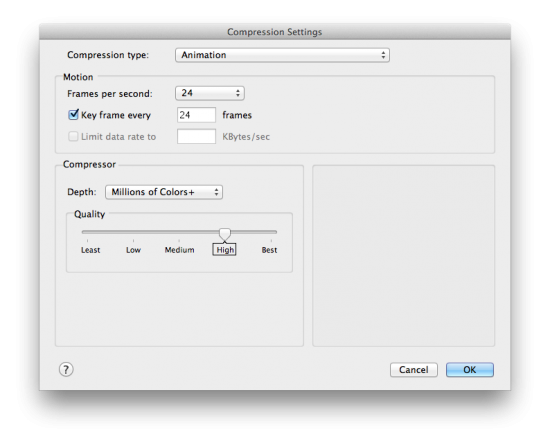 On the next page choose Animation as your compression codec. That’ll keep it in one neat file. On the bottom of that page, select 16 Million+ colours (the + being the Alpha Channel – that’s very important to retain transparancy information in the movie). Hit OK and let the render magic begin. thanks so much for this discussion and the screenshots. That section in the anime studio pro 8 manual completely mystified me and I’ve been searching online for hours looking for a solution. I am preparing images and small videos for an iPad storybook app and need transparent backgrounds to send to the programmer. I’ve followed the steps you describe, but my final movie shows a black background. How do I know this will be transparent when the programmer embeds it into the app? Again, thank you for your excellent posting. The best way to test the transparency is to re-import your render back into an animation or a video editor and check that the alpha channel gets recognised. I would use a background that you know, could be just a simple colour fill of your choice other than black. Add your animation to the foreground and all should be well. How i can get the compression codec in this new version? Thank you!